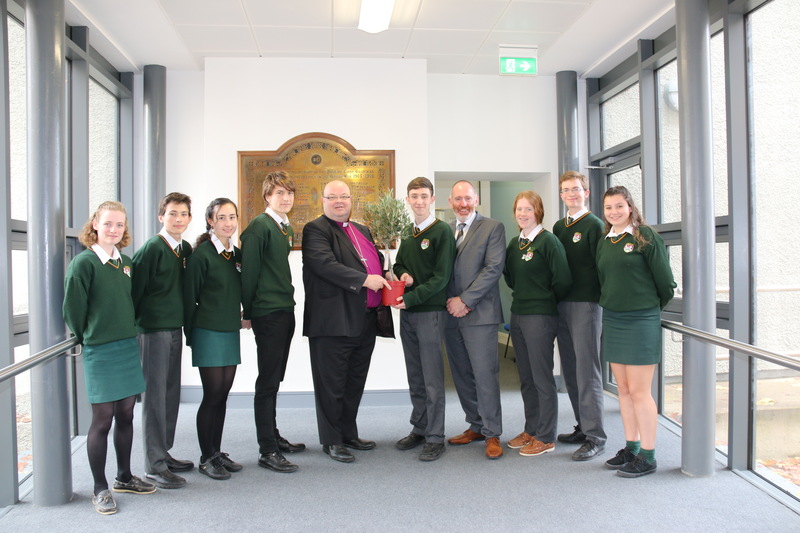 In the week before 11th November 2018, the centenary of the Armistice at the end of the First World War in 1918, the Bishop of Cork, Dr Paul Colton, arranged to distribute an olive tree to each school in the United Dioceses of Cork, Cloyne and Ross. These were then the focus of acts of commemoration at school assemblies and activities to mark the end of the First World War. Some of the olive trees given by Bishop Colton to schools in Cork, Cloyne and Ross. I’m told also that the olive branch is a symbol of peace because olive trees grow very slowly and they were not, therefore, cultivated during war time. They were, so to speak, peacetime trees. It is no surprise, therefore, that when a flag was being developed in 1946 for the United Nations it featured olive branches ’embracing’ the world. For Christians, the Mount of Olives is one of the places where Jesus taught, including about suffering;and it’s the place where he stood and looked at the city and wept. And the Garden of Gethsemane, where Jesus prayed (and the disciples slept) the night before his death. The olive branch is rich in this symbolism and much more besides in many ancient traditions, not solely Christian. Here is a representative sample of how schools in Cork, Cloyne and Ross used the olive trees in their recent commemorations. 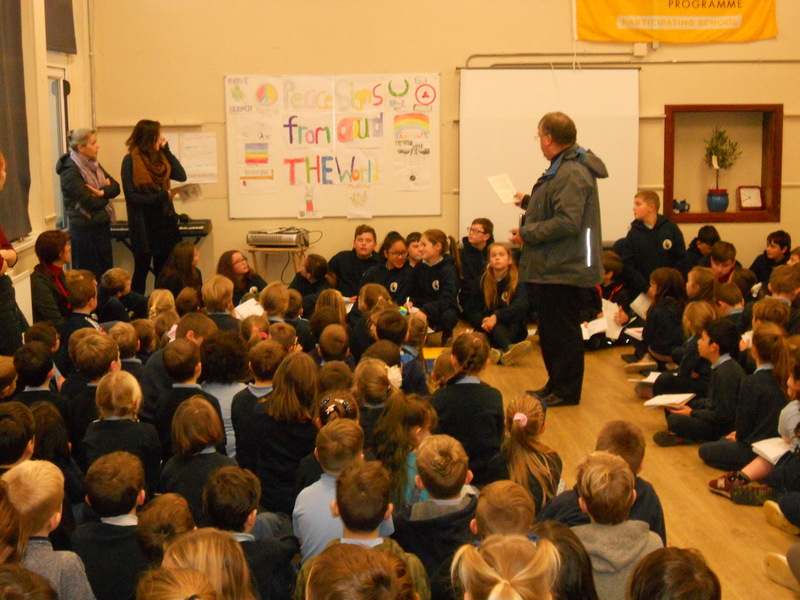 We held a special school assembly on Friday to mark the centenary of the First World War. Many students from 6th class lead the assembly. 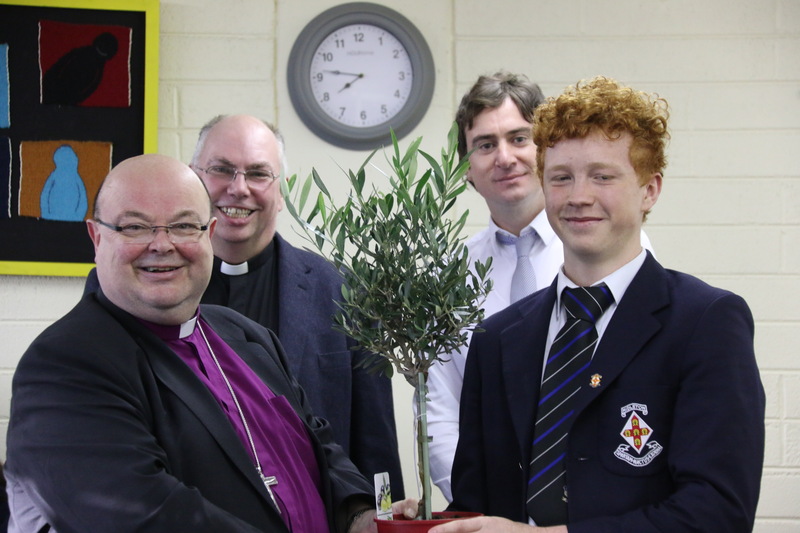 An olive tree was presented to the school by Dean Susan Green, a present from Bishop Paul Colton. The Olive tree is a symbol of peace and reconciliation. Dean Susan Green speaks at the assembly in Midleton. Kilgarriffe National School Armistice 100 School Assembly took place on Tuesday 13th November in our senior classroom and was led by both the Rev. Kingsley Sutton and Dean Chris Peters. 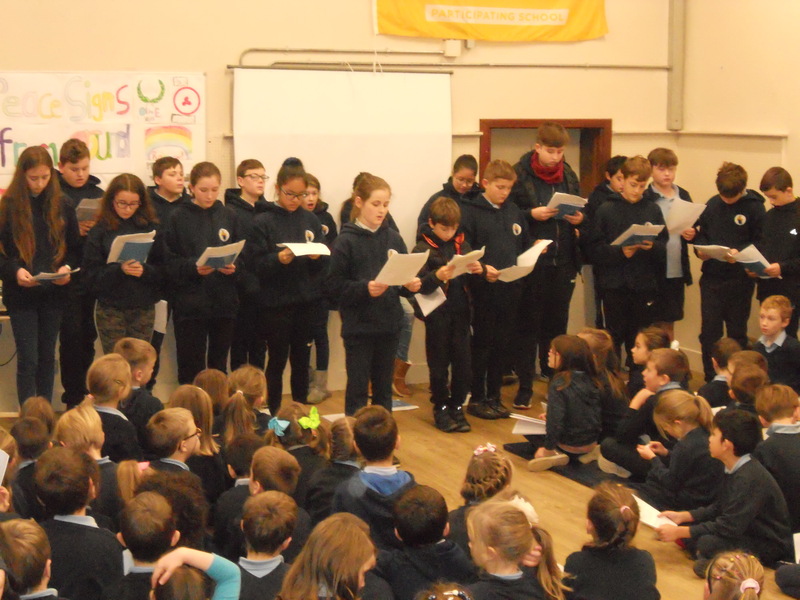 The whole school were in attendance and 4th to 6th Class pupils lead all the readings. 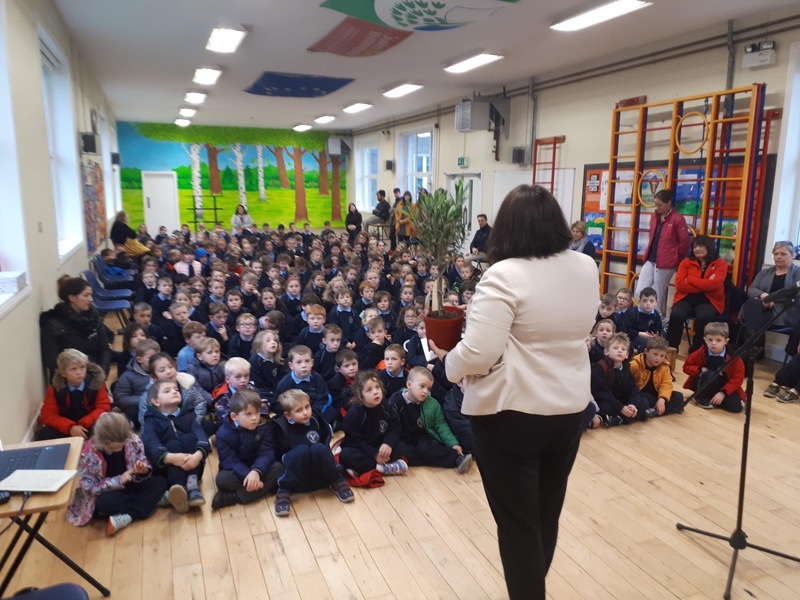 It was a lovely gathering which was made extra special with the presentation of the symbolic ‘Olive Tree’ to the children, which we thank you very much for. Our principal Susan Hanbidge, had already formally received this on behalf of the school, on Sunday 11th at the Kilgariffe Church Armistice Service. 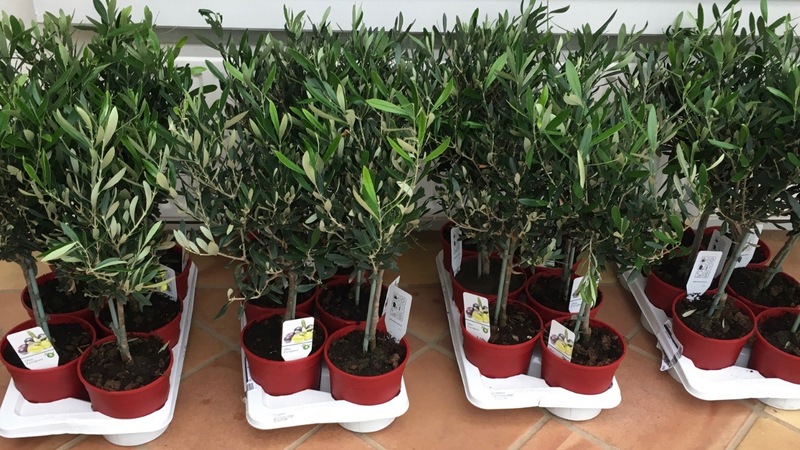 The Olive Tree has now been planted in a big pot and is being lovingly cared for indoors for the winter months, as recommended by our local garden centre. 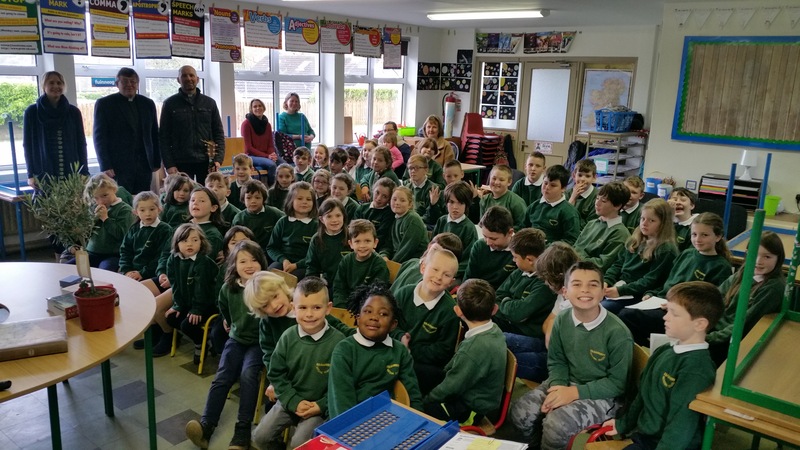 Clergy, teachers and students at Kilgariffe National School in Clonakilty. Thank you for your most symbolic gift to commemorate Armistice Day. We have planted it in a pot for the moment, so it may grow outside, but so that we can bring it in if the weather gets too cold this winter. I understand that it can stand temperatures as low as -10C anyway, so we’re hopeful we’ll keep it alive! Our Armistice Service was a lovely event. Led by the Rev. Cliff Jeffers and attended by some parents as well as the children, we discovered that 43 of those who died were Dunmanway men. Of these 8 were Church of Ireland, 1 was Methodist and 34 were Roman Catholic. Some died at sea, on the battlefield, of wounds in hospital or of ‘Spanish flu’. The war affected all stratas of society and religious groups and remembering them made us more aware of the awfulness of war and the high price paid by both the people who fight and their families. We remembered that wars are still happening making life miserable for those who suffer. Our Olive tree plus the dove from the top of the commemorative plaque in St. Mary’s Church will help us remember our aspiration for peace and tolerance in the world today. 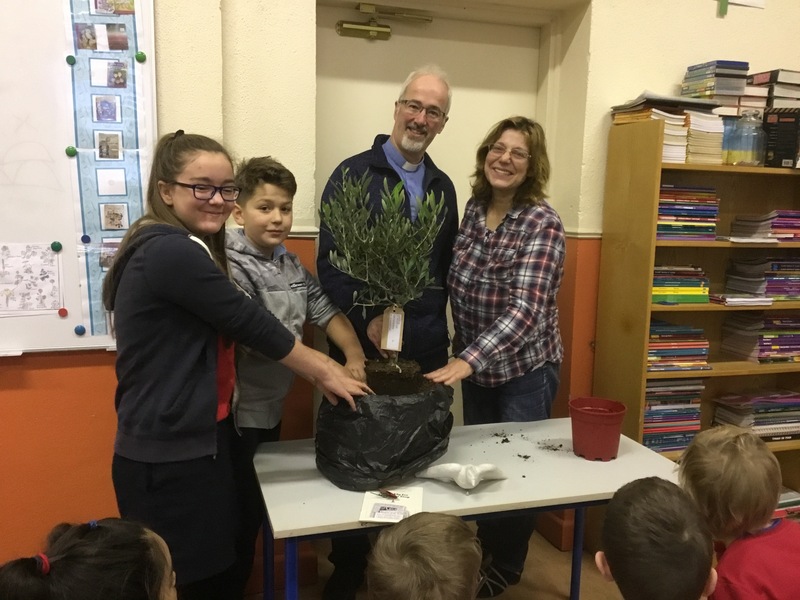 Children at the Model School Dunmanway with their olive tree, and the Reverend Cliff Jeffers, and Sharon Hosford, Principal. 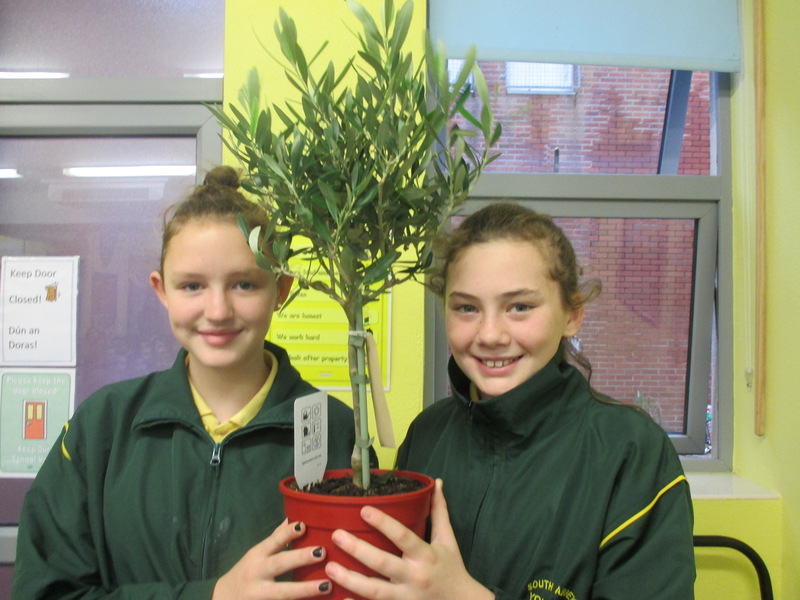 Thank you for the Olive Tree and the script for the assembly which was a huge success. he assembly , as well as commemorating Armistice 100, was an effective tool on forgiveness , “letting things go” and taking the first step. The Katie Perry and Taylor Swift reference brought the peace process bang up to date as many of the older pupils knew all about it. Attached are some photos of the event. It was a joint presentation between the Reverend Denis Mac Carthy and 6th class. The Reverend Denis MacCarthy spoke to the pupils and staff at Bandonbridge National School. At Bandonbridge the commemoration was led by SIxth Class. 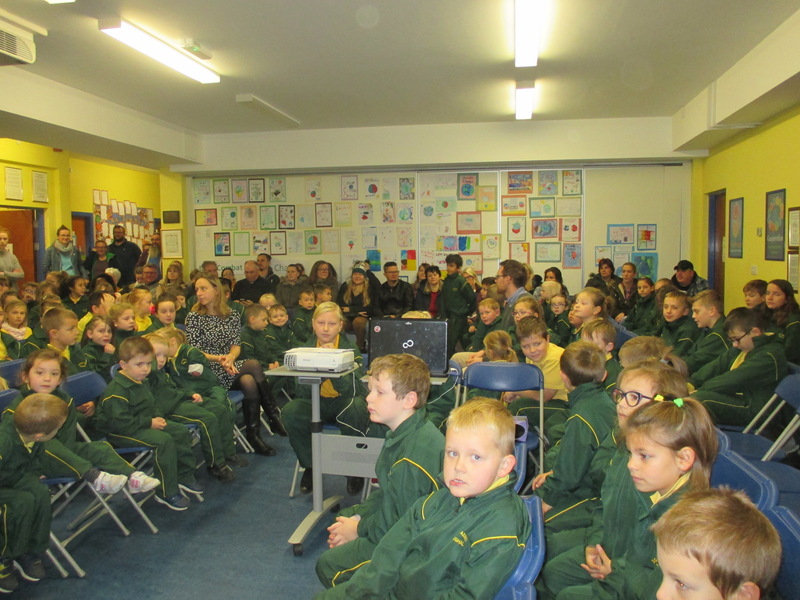 Grandparents, parents, staff and children gathered for our assembly on 8th November. The Rev. Peter introduced the assembly and led our time of silence leading up to 11 a.m. 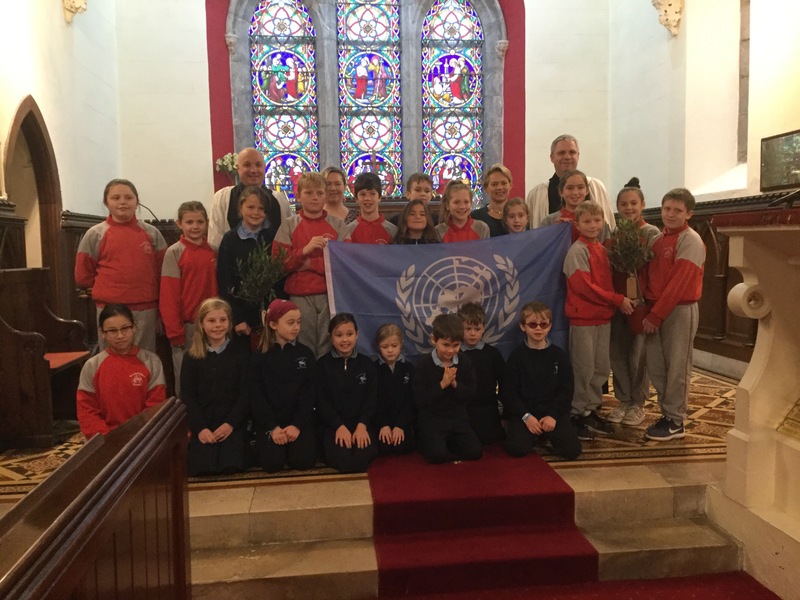 He recalled about last week’s assembly when he spoke of the United Nations flag and the symbolism of the olive tree which took pride of place at the front, surrounded by photographs and medals brought to school by the children. Project work about World War 1 decorated the classroom walls. 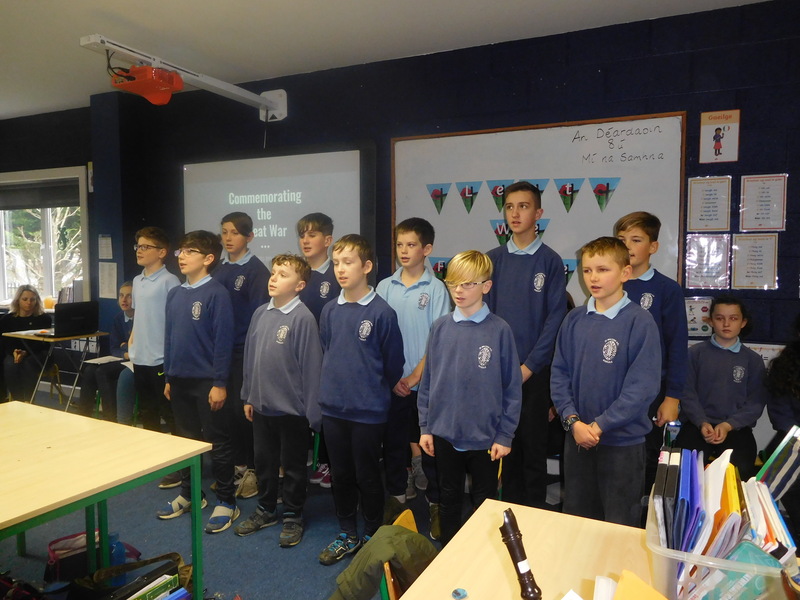 5th and 6th class pupils recited The Soldier’s Grave by Francis Ledwidge and narrated the assembly accompanied by displayed images. As the Roll of Honour from St. Multose Church was read aloud, children from 4th class brought up the poppies they’d made, using a shamrock as background; each had the name of a soldier from the parish who had died during the First World War written on it. The Rev. Peter Rutherford used these poppies during his Remembrance Sunday service. 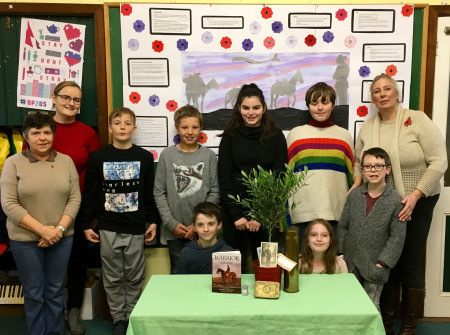 Before the blessing, Isaiah 2: 4-5 was read, and then parents, children and staff shared their personal histories; stories of relatives who had fought in WW1 – those who returned and those who did not. It was a poignant occasion and those visitors who attended found it moving and beautifully prepared. Some of he young people who participated in Kinsale. In Desertserges National School Devyn brought in a WW1 shell and some iron pellets. Harry brought in a picture of his great-grandfather who fought in WW1. The school has written a blog about commemorations there, including a special project about animals during the war. It is here. At Desertserges there was also a special project undertaken about animals in the FIrst World War. Senior pupils led the special Assembly for Armistice Day together with some staff and members of the Board of Management. 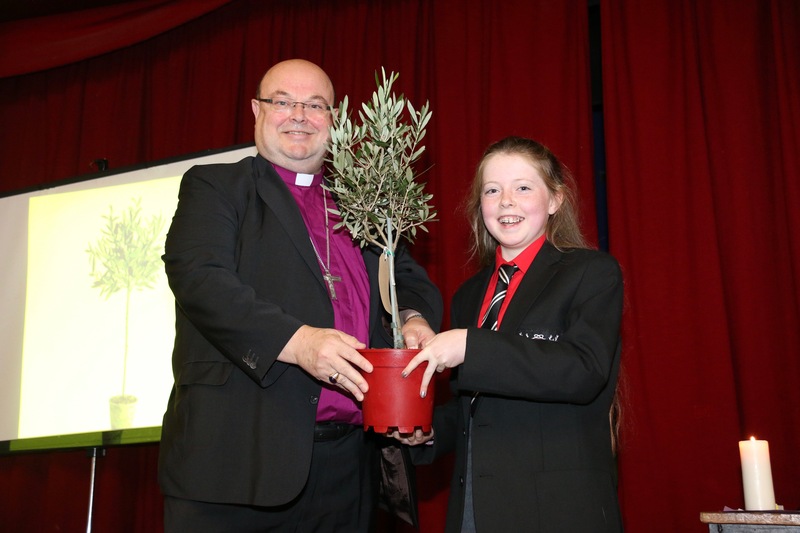 The olive tree, received as a gift from Bishop Colton took centre stage in the Assembly. Garrett Wrenne, a parent of one of our pupils is currently serving in the Irish Army and has completed seven peacekeeping missions, the last being in Syria. Garrett spoke to us about the use of the olive branch as a symbol. Pupils from 2nd and 4th class had decorated the hall with poppies and a banner for the assembly. Dr. Andrew Gleasure Chairperson of the Board of Management of St Mary’s Church of Ireland National School in Carrigaline, with Garrett Wrenne (a parent), Valerie Eliffe (Principal) and the Reverend Elaine Murray. Remembering in St Mary’s Church of Ireland National School, Carrigaline. 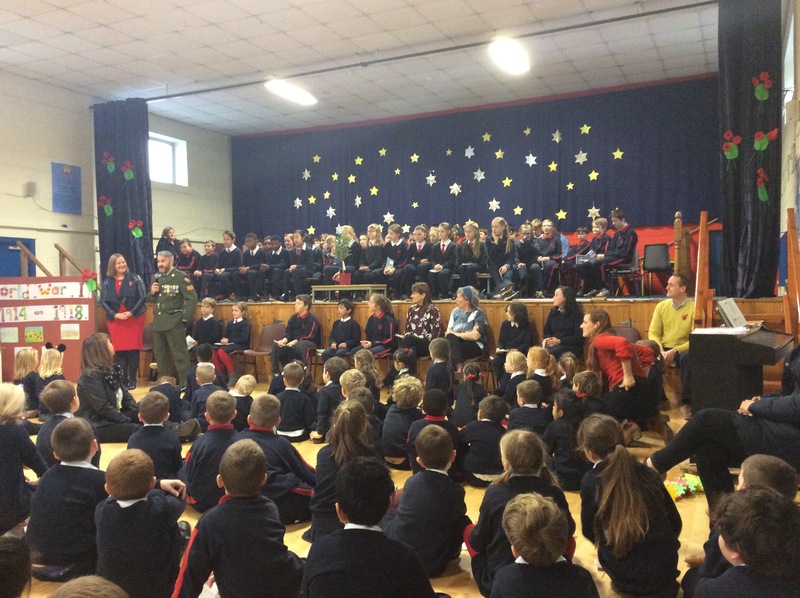 In St Fin Barre’s National School we had an assembly for Armistice Day led by the children of 5th and 6th Class on Wednesday 7th November 2018.The whole school attended. 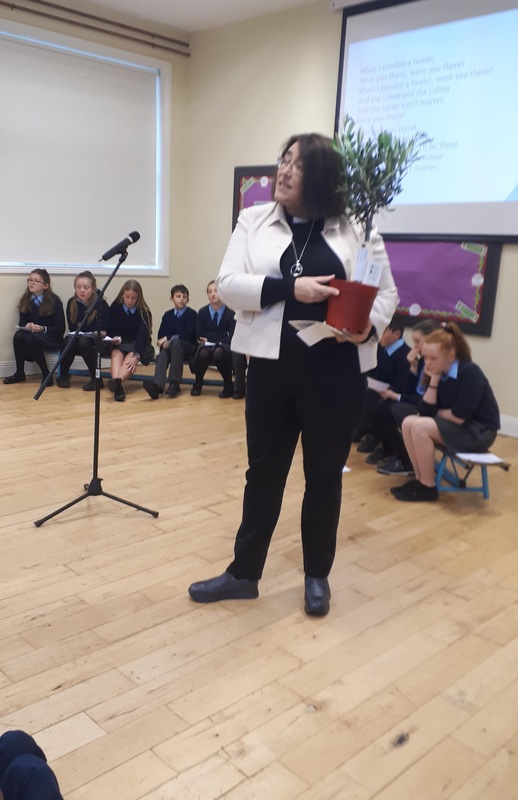 The oldest and the youngest children in our school will be responsible for planting our Olive tree so kindly given to us by the Bishop as a symbol of remembrance and peace. 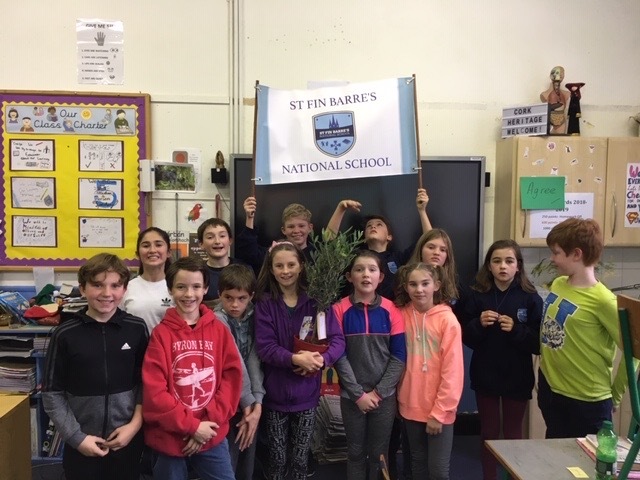 Commemoration at St Fin Barre’s National School, Gilabbey Terrace, Cork. 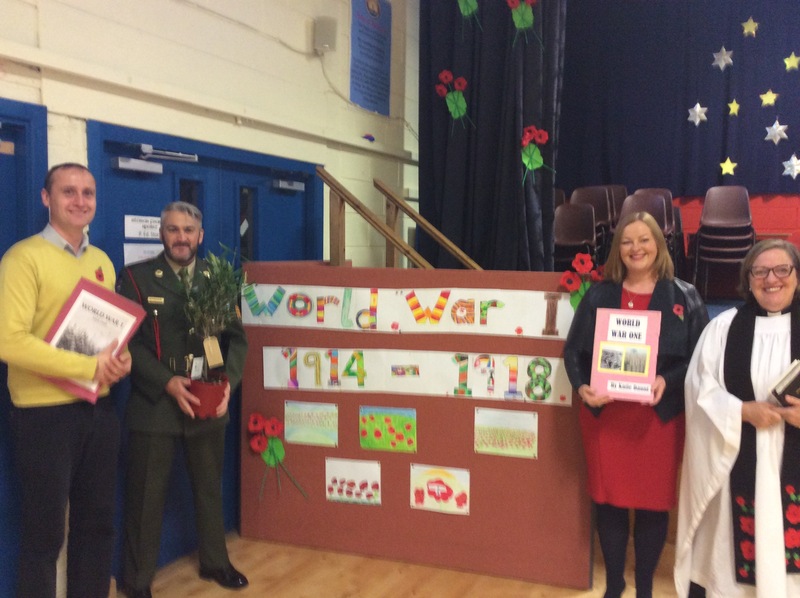 Here are some pictures of the Armistice Day assembly in South Abbey N. S., Youghal on Friday, 9th November, with the children, staff and parents. The Rev. Andrew Orr gave the closing address. 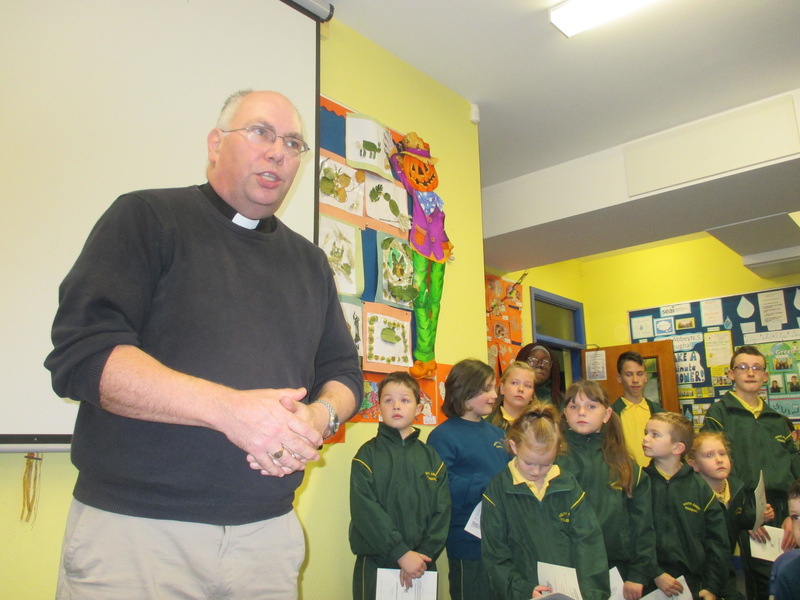 In Youghal, the Reverend Andrew Orr spoke with the pupils and staff at the school. Pupils of South Abbey National School, Youghal, with their tree. South Abbey National School, Youghal. A special Commemoration of Armistice Day Assembly was held on 9th November in St. Luke’s Church, Douglas. Pupils from the two schools in the parish of Douglas Union with Frankfield – St. Michael’s, Blackrock and St. Luke’s School – came together for this special occasion. Children from St Luke’s National School, Douglas, and St Michael’s National School, Blackrock at their special joint commemoration in St Luke’s Church, Douglas with the clergy and school principals of the parish. 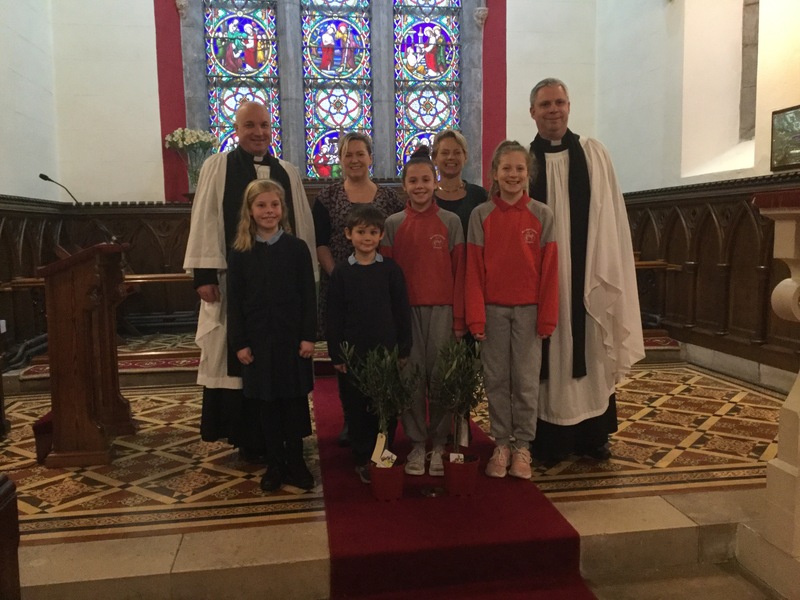 Children from St Luke’s National School, Douglas, and St Michael’s National School, Blackrock at their special joint commemoration in St Luke’s Church, Douglas with their olive trees from the Bishop. They also did a special study of the flag of the United Nations with its olive branches. 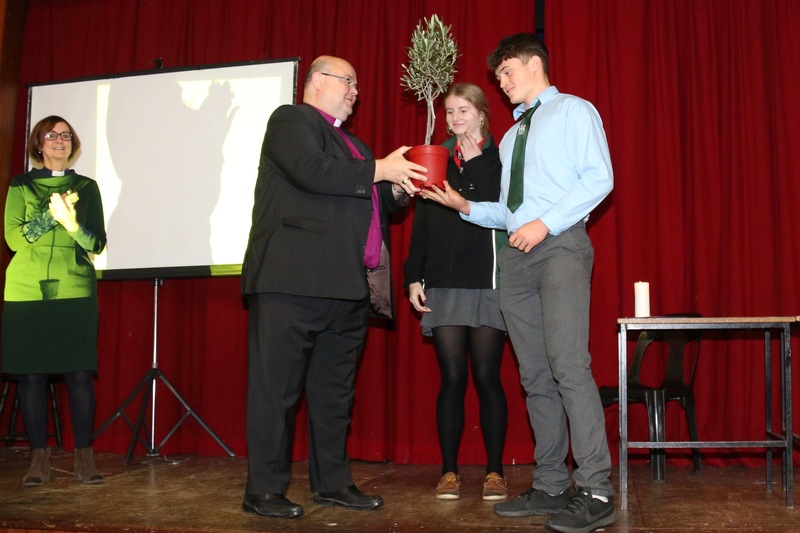 The Bishop himself visited the three second level schools in the Diocese to speak about the commemorations, to hear from students about research they have been doing, and to present each with an olive tree. Presenting the olive tree at Bandon Grammar School, first at junior school assembly. And then, at Bandon Grammar School, at Senior Assembly. Ashton School, Cork, in front of the Cork Grammar School war memorial naming 53 past pupils who died in the First World War. This entry was posted in Anniversaries, Ashton School, Bandon Grammar School, Centenaries in Ireland, Centenary, Church in Society, Community Involvement, Cork, Diocese, Education, Five Marks of Mission, Remembrance, Schools in the Diocese, Students. Bookmark the permalink.